Twice a week Haunold mountain offers a very special skiing experience. During the day the ski region close to your Leitlhof Holiday Hotel is very popular, especially with families. 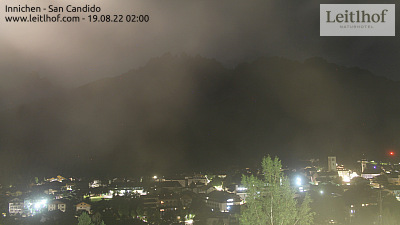 During the night the snow on the local mountain still shines brightly: go down the slopes in Innichen under the floodlight and enjoy the fascinating atmosphere during a Dolomite night. After the sunset the night owls come alive and can enjoy fabulous night runs on the Haunold. Turn the night into day and enjoy the starry sky in Hochpustertal. It’s always a night to remember and a great experience. The 4-seat chairlift will take you up to 1,500m – from here you can enjoy a wonderful night panorama with views down on Innichen in Hochpustertal. Pause for a moment and take in the views. With the typical South Tyrolean delicacies in your tummy you can walk out of the cosy Riese-Haunold-Hütte hut right next the lift and start your downhill run under Pustertal’s stars. The toboggan run is also accessible on two evenings a week. Toboggans and headlights are available at the valley station. Until late March you can enjoy night skiing every Tuesday and Friday between 7pm and 10pm. Don’t miss out on this unforgettably experience during your skiing holiday at the Leitlhof Hotel in Innichen, South Tyrol and send us your no obligation holiday enquiry or book directly online.